Hello and happy Tuesday. It's time for another challenge at CASology. 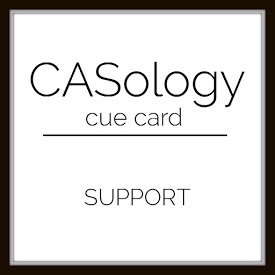 This week, our cue word is support. Seeing how October is breast cancer awareness month, I decided to make a card that would show my support to someone facing that dreaded diagnosis. I covered my card front with die cut words of hope (literally) and kept only one of them colored. Now it's your turn. How does HOPE inspire you? I hope you play along this week. Please remember to keep it Clean and Simple. We are sponsored this week by A Jillian Vance. I loved this from the moment I first saw it, Joyce! So creative the way the die cuts provide texture and then that single pop of color really draws the eye in and delivers the message! Just perfect. I love the effect of all the white die cuts and a pop of pink...especially perfect for Breast Cancer Awareness! Fabulous card, Joyce! This is beautiful Joyce! They word die is awesome! Joyce....this is one inspiring card! So in love with how you used that amazing die. Simply beautiful! Love this technique! Gives so much awesome texture! Wow that must have taken alot of time to paste them on but it was worth it as its really classy and pretty! This looks sensational, Joyce! I love the random placement of the sentiments. It really adds to the optimism that this card conveys. CAS perfection! I love the texture of the multiple die cuts, Joyce, and then there is the pink one that says it all. A pretty pop of pink, this is wonderful!